Use Canva to design a comparison chart that's easily readable and clear to your audience. Do you need to compare multiple options or make complex decisions simpler? Instead of wading through pages of text why not present your information or data in an easily digestible comparison chart? Use a comparison chart to present the different packages you offer, rate anything, or help your customers choose from a range of products. Sounds complicated? It doesn’t have to be. Just choose from one of our professionally designed templates to start your design. Created especially for non-designers, our user-friendly interface makes designing as simple as dragging and dropping elements. And did we mention our tools are free? Just create an account to start designing. Create a new Canva account to get started with your own comparison chart design. With Canva’s media library you have access to bold colors, creative typography, icons and much more – so creating an engaging graphic is easy. Veer away from drowning your readers with blocks of text by substituting your headers with icons when you can. Our images and icons library contains more than a million photos, illustrations and icons to choose from. If you’re comparing different brands, you can even upload their logos. Just head to your Uploads folder and choose any PNG, JPEG or SVG file from your computer. Canva grids are especially helpful when creating comparison charts. To add your own grid into your design, head over to the elements tab on your objects panel and click on the “Grids” folder. Select the grid that best fits your comparison chart and add it to your design. 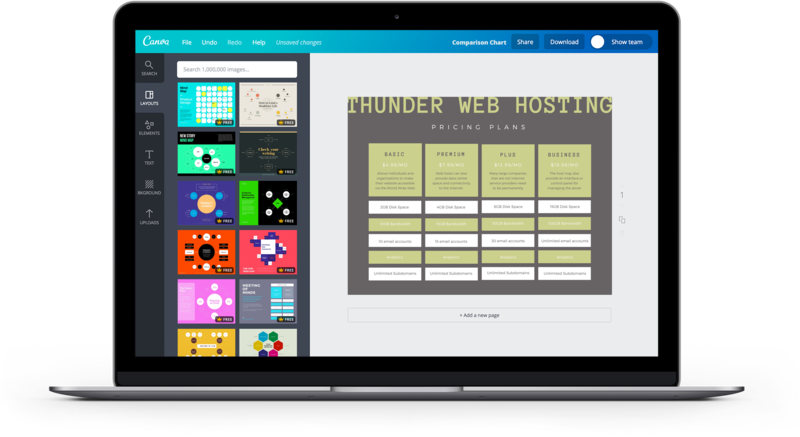 Canva’s design grids are super versatile. You can fill grids with with photos or with solid colors then add text on top. Fill a box with a flat color by selecting the box and choosing a color from the palette or color wheel. Then, layer some text over it by going to the text tab and selecting any of the text holders or text formats offered. Need to get a client’s or colleague’s feedback? It’s as easy as clicking the “Share” button to give them access to edit or comment on your chart. Anyone you choose to share your design with can access it from any computer, iPhone, iPad or Android devices. Need to print your comparison chart? No problem. Once you are done editing just hit the ‘download’ button where you have the option of saving your finished design as a high-res PNG or PDF file. Send that to your printer or email it directly to your client or team by clicking the share button. Then sit back and give yourself a high five for a job well done. Are the comparison chart templates free to use in Canva? All of the layouts in our library are free to use as many times as you like. There are also a large range of free images to choose from, otherwise all premium photography, vectors and illustrations in our stock library is all priced at just $1. There are no other fees to use Canva. How do I use alignment to organize my comparison chart? Every design needs balance. Ensuring that your designs are well aligned or well-distributed means that it won’t look cluttered or crowded. Begin by selecting the elements or text you want to align by clicking on it, then click the group button on the toolbar. Once all elements are grouped, click on the arrange button and select whether to align: left, right, center, top, middle, or bottom. To set how you want the elements spaced evenly, click on the Horizontal or Vertical button. Can I edit my comparison chart after I've saved it? You can edit and save your comparison chart as many times as you like. Every time you create a new design, it will appear in the “My Designs” section of your Canva homepage.